Theodore of Mopsuestia (c. 350 - 428), was bishop of Mopsuestia (modern Yakapinar, Turkey) from 392 to 428 C.E. He is also known as Theodore of Antioch and Theodore the Interpreter. A representative of the Antiochene school of hermeneutics, he was considered by many to be the foremost biblical interpreter of his day. After his death, however, he became a figure of controversy and some of his writings were condemned for the "heresy" of Nestorianism. After studying philosophy under the sophist teacher Libanius, a fellow student, John Chrysostom, convinced Theodore to become a monk in 369. He was ordained a priest in the early 380s and became a prolific writer on biblical topics and was elevated to the position of bishop of Mopsuestia, circa 392. By the early fifth century, Theodore had become the best known spokesman of the Antiochene school. He rejected the allegorical interpretation used by the rival Alexandrian school and utilized a critical-historical approach that in some ways anticipated the methods of modern scholars. Theodore's writings strongly influenced the churches of the Eastern Roman Empire that aligned themselves with Patriarch Nestorius of Constantinople. Nestorius was condemned as a heretic at the Council of Ephesus (431). The Second Council of Constantinople (553) condemned certain of Theodore’s supposed views during the so-called Three-Chapters controversy. Theodore is still highly honored by the Assyrian Church of the East and other eastern churches which practice the East Syrian rite. He recently received new attention in the West, where he had been largely ignored since the sixth century. Theodore was born to a wealthy family at Antioch, Syria where his father held an official position. His brother Polychronius became bishop of the metropolitan see of Apamea. According to Syrian sources, Theodore was the older cousin of Nestorius, with whom he would later be associated theologically. Theodore first appears in the historical record as the early companion and friend of John Chrysostom in Antioch. There, Chrysostom and he attended the lectures of the noted Sophist and teacher of Greek rhetoric, Libanius (Socr. vi.3; Soz. viii.1). Chrysostom relates that Theodore was a diligent student, although he was not immune to the temptations of the luxurious life of upper-class Antiochan society. After Chrysostom had been converted to the monastic life of Basil of Caesarea, he convinced Theodore to likewise commit himself to an ascetic lifestyle. Together with their friend Maximus of Seleucia, they left the academy of Libanius and entered the monastic school of Diodore of Tarsus, to which Basil was already attached. According to Chrysostom, Theodore had just assumed a celibate life when he became fascinated by a girl named Hermione and contemplated marriage, temporarily returning to his former manner of life (Soz. viii.2). His "fall" spread consternation through the small monastic community, and inspired Chrysostom to compose his earliest know literary compositions—two letters known as "to Theodore upon his lapse." These compositions may have helped convince Theodore to re-commit to his vows, which he soon did. Still barely 20, Theodore now devoted himself to study of the scriptures and to theological compositions. He seems to have remained as Diodore's pupil until the latter's elevation to the position of bishop of Tarsus in 378. The later years of this decade witnessed Theodore's first appearance as a writer. He began with a commentary on the Psalms, in which he showed a propensity for critical thinking and decided that most of the Psalms were not of Davidic origin. His historically-oriented analysis would also lead him to reject the canonicity of the Books of Chronicles and the Catholic epistles. Sometime in the early 380s, Theodore was ordained as a priest. He soon displayed a keen interest in the polemical theological discussions of the time, writing and preaching against the Origenists, Arians, Apollinarists, Julian the Apostate, and others. His versatile literary activity won him the name of "Polyhistor" (Sozomen, op. cit., VIII, ii). Theodore apparently left Antioch before 392 to join Diodore at Tarsus (Hesychius Hier., op. cit., in Mansi, IX, 248). Theodore's great treatise on the Incarnation was reportedly written during this period, as well as several of his commentaries on the Old Testament. He remained in Tarsus until 392, when he was consecrated as bishop of Mopsuestia, probably through the influence of Diodorus. Mopsuestia lay on the Pyramus (Ceyhan) river, midway between Tarsus and Issus and 12 miles from the sea. In the fourth century it was of some importance, famous for its bridge, which was built by Constantine I. He spent the remaining 36 years of his life as bishop in this town. 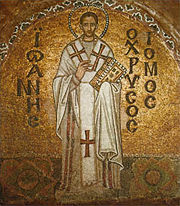 Theodore worked to defend his old friend John Chrysostom, who had been deposed and exiled as patriarch of Constantinople. In 394 Theodore attended a local synod at Constantinople, during which he preached before the Emperor Theodosius the Great. The sermon made a deep impression, and Theodosius, who had learned from both Ambrose of Milan and Gregory Nazianzus, declared that he had never met with such a teacher (John of Antioch, ap. Facund. ii.2). Theodosius II inherited his grandfather's respect for Theodore and often wrote to him. During the controversies concerning John Chrysostom, who had offended the eastern empress Aelia Eudoxia and was accused of the "heresy" of Origenism, Theodore remained faithful to his old friend. Chrysostom (Ep. 204) thanked him profoundly for frequent though ineffectual efforts to obtain his release, and praised their friendship in glowing terms. The exiled patriarch stated that he would "never forget the love of Theodore, so genuine and warm, so sincere and guileless, a love maintained from early years, and manifested but now." Although he was later criticized for anticipating the "heresy" of Nestorius, during his lifetime Theodore was regarded as orthodox and as a prominent ecclesiastical author. Little in his writings speaks directly to the Christological teaching for which he was condemned. However, like several figures in the early church, Theodore was a universalist, believing that all people would eventually be saved. Around 421, Theodore received hospitably certain members of the Pelagian party, and is thought by some to have been influenced by their theology. However, he later associated himself with the condemnation of Pelagianism at a synod in Cilicia. He died in 428, the year in which Nestorius succeeded to the episcopal see of Constantinople. The popularity—and later the criticism—of Theodore increased following his death. Theodoret of Cyrrhus regarded him as a "doctor of the universal church." Cyril of Alexandria relates that "We believe as Theodore believed; long live the faith of Theodore!" was a cry often heard in the churches of the East (Ep. 69). When the bishops of Syria were called on to criticize his view, they reportedly replied: "We had rather be burnt than condemn Theodore" (Ep. 72). Nestorius: Although Theodore was not accused of heresy during his lifetime, certain of his writings were condemned as "Nestorian" during the Three-Chapters controversy. Yet, by 431, the African church writer Marius Mercator denounced him as the real author of the Pelagian heresy (Lib. subnot. in verba Juliani, praef) and the precursor of Nestorianism. The Council of Ephesus (431) condemned ideas attributed to Theodore, but without mentioning him by name. In 436, Patriarch Proclus of Constantinople demanded from the bishops of Syria a condemnation of certain propositions supposed to have been drawn from the writings of Theodore. Cyril of Alexandria, who had once spoken favorably of some of Theodore's works (Facund. viii.6), now wrote to the emperor (Ep. 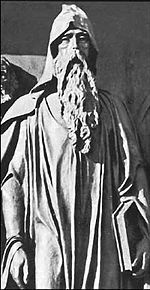 71), that Diodore and Theodore were the parents of the "blasphemy" of Nestorius. For their part, members of the Nestorian party compounded the problem by citing Theodore's words as affording the best available exposition of their own views (Liberat. Brev. 10). Ibas, who became bishop at Edessa in 435, promoted Theodore's theology at his academy until it was suppressed by the pro-Monophysite Emperor Zeno in 489. Barsumas of Nisibis, however, provided a new home for the school, and the Persian kings, favored the movement. Among the Nestorians of Persia, the writings of Theodore were regarded as the standard both of doctrine and of interpretation. The sixth century witnessed another and final outbreak of hatred against Theodore. In an effort to make peace with the Monophysites under the influence of the emperor Justinian I, the Second Council of Constantinople (553) condemned certain writings of Theodore—together with certain alleged propositions of Theodoret and Ibas—during the co-called Three-Chapter Controversy. The council was criticized for reopening previously resolved issues and was strongly resisted in the West as an example of ceasaropapaism. However, it was eventually accepted, after which the name of Theodore disappeared almost entirely from western church literature. It was only in the nineteenth century that western writers began to recognize the importance of the great Antiochene as a theologian, expositor, and a precursor of later exegetical principles. The Nestorian churches of the East, meanwhile, continued to hold him in high regard through the current era. His liturgy is still used by many of the Christian churches of Iraq and Iran. Theodore's commentary on the minor prophets has been preserved and was published in Rome in the early nineteenth century. It is a considerable monument of his expository power and is considered the best surviving illustration of the Antiochene method of interpreting Old Testament prophecy. A complete Latin translation of his commentary on Galatians and other Pauline letters was published by Cambridge University Press, 1880-1882. His commentaries on the rest of the Bible have survived only in quotations and excerpts. Substantial fragments of his commentaries on the Psalms demonstrate his anticipation of the historical-critical method of biblical interpretation. He considered many of the Psalms to be of late origin and disagreed with the usual interpretation of Christian writers to see them as referring to Christ. Fragments have also been preserved of his major work on the Incarnation. The work was temporarily recovered in 1905 in a Syriac translation at a Nestorian monastery in the mountains of northern Iraq. Unfortunately it was again lost in the destruction of that library by Turkish troops during the massacres of Christians 1915. A number of recent studies have been devoted to his works. Dewart, Joanne McWilliam. The Theology of Grace of Theodore of Mopsuestia. Washington, D.C.: Catholic University of America Press, 1971. ISBN 9780813205236. McLeod, Frederick G. Theodore of Mopsuestia. The early church fathers. London: Routledge, 2009. ISBN 9780203893715. Mingana, Alphonse. Commentary of Theodore of Mopsuestia on the Nicene Creed. Piscataway: Gorgias Press, 2007. ISBN 978-0900653056. Theodore, and Robert C. Hill. Commentary on the Twelve Prophets. The fathers of the church, v. 108. Washington, D.C.: Catholic University of America Press, 2004. ISBN 9780813201085. Zaharopoulos, Dimitri Z. Theodore of Mopsuestia on the Bible: A Study of His Old Testament Exegesis. New York: Paulist Press, 1989. ISBN 9780809130917. History of "Theodore of Mopsuestia"
This page was last modified on 24 November 2015, at 21:14.